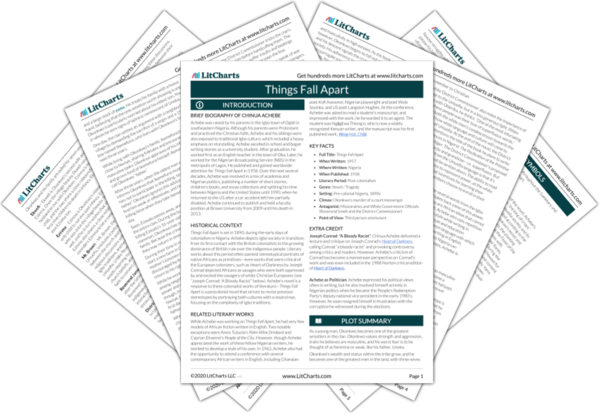 Instant downloads of all 942 LitChart PDFs (including Things Fall Apart). 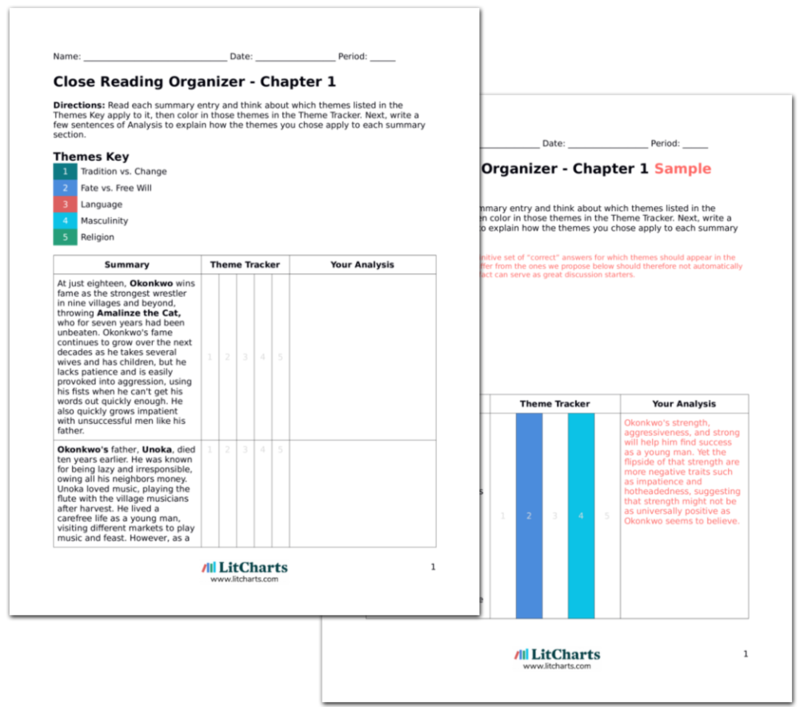 LitCharts assigns a color and icon to each theme in Things Fall Apart, which you can use to track the themes throughout the work. Religion is the main arena where both cultural differences and similarities play out at the end of the novel. Religion represents order in both societies, but they manifest differently. While religion in Umuofia society is based on agriculture, religion is seen as education in the white man's world. As a result, the gods in Umuofia society are more fearsome, since clan members are at the mercy of natural cycles for their livelihood. Mr. Brown, the white missionary, condemns this idea of fearing your god, but in fact the white man's religion takes root using fear tactics as well. When clan members break certain laws or displease the white men, they're locked up, starved, and beaten. The dialogue between one of the clan leaders of a neighboring tribe, Akunna, and Mr. Brown reveals how much both systems of religion have in common. Akunna agrees, for example, that their wooden carvings of deities are just that—wooden carvings—but he likens it to the figure of Mr. Brown: he's also just a conduit or symbol for the western God. Akunna expresses what the narrator has already suggested—that the Umuofia people only pretend to believe in certain aspects of their religion, such as the masked gods who are really tribe members wearing masks. This dialogue about religion does a lot to carry out Achebe's mission of depicting Nigerian society as one that's far from primitive—depicting it instead as a culture with mythologies and rituals and an understanding of the mythologies behind those rituals. It's also one of the moments when more similarities than differences are stressed between the two cultures. Religion also returns us to the Yeats poem quoted in the epigraph. The poem uses plenty of ominous Biblical language in describing an apocalyptic scenario, which parallels the situation in the novel where religion is the vehicle for the fall of Umuofia society. Western religion breaks order in the Umuofia society by taking in outcasts and clan members without title and giving them power. By taking power away from the clan's authorities, western religion destroys the clan's old methods of justice and order, creating an apocalyptic scenario for the clan's former way of life. The ThemeTracker below shows where, and to what degree, the theme of Religion appears in each chapter of Things Fall Apart. Click or tap on any chapter to read its Summary & Analysis. 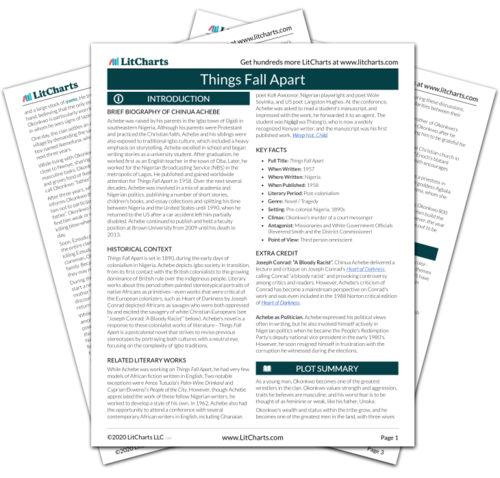 Get the entire Things Fall Apart LitChart as a printable PDF. 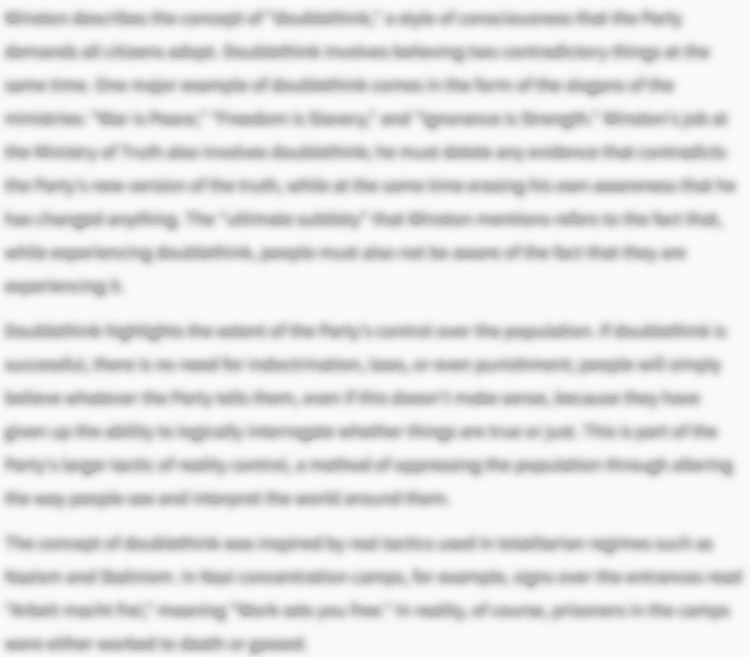 Below you will find the important quotes in Things Fall Apart related to the theme of Religion. And in fairness to Umuofia it should be recorded that it never went to war unless its case was clear and just and was accepted as such by its Oracle – the Oracle of the Hills and the Caves. And there were indeed occasions when the Oracle had forbidden Umuofia to wage a war. If the clan had disobeyed the Oracle they would surely have been beaten, because their dreaded agadi-nwayi would never fight what the Ibo call a fight of blame. 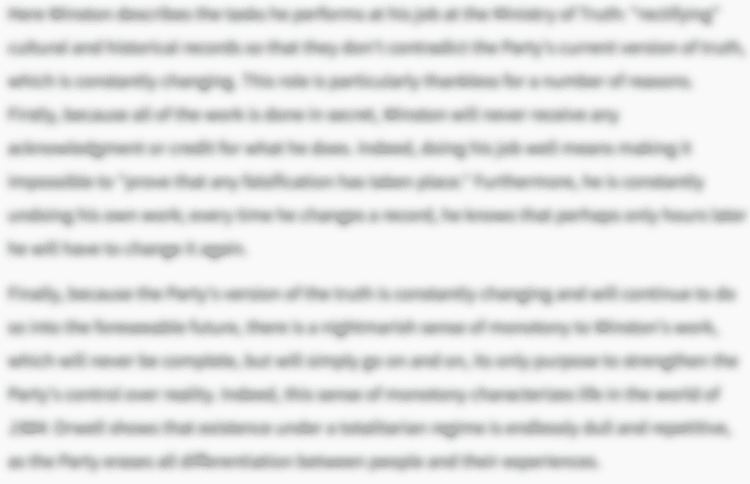 Unlock explanations and citation info for this and every other Things Fall Apart quote. Unoka was an ill-fated man. He had a bad chi or personal god, and evil fortune followed him to the grave, or rather to his death, for he had no grave. He died of the swelling which was an abomination to the earth goddess. But the Ibo people have a proverb that when a man says yes his chi says yes also. Okonkwo said yes very strongly; so his chi agreed. Okonkwo did as the priest said. He also took with him a pot of palm-wine. Inwardly, he was repentant. But he was not the man to go about telling his neighbors that he was in error. And so people said he had no respect for the gods of the clan. As soon as the day broke, a large crowd of men from Ezeudu's quarter stormed Okonkwo's compound, dressed in garbs of war. They set fire to his houses, demolished his red walls, killed his animals and destroyed his barn. It was the justice of the earth goddess, and they were merely her messengers. They had no hatred in their hearts again Okonkwo. His greatest friend, Obierika, was among them. They were merely cleansing the land which Okonkwo had polluted with the blood of a clansman. A man could not rise beyond the destiny of his chi. The saying of the elders was not true—that if a man said yea his chi also affirmed. Here was a man whose chi said nay despite his own affirmation. He told them that the true God lived on high and that all men when they died went before Him for judgment. Evil men and all the heathen who in their blindness bowed to wood and stone were thrown into a fire that burned like palm-oil. But good men who worshipped the true God lived forever in His happy kingdom. But there was a young lad who had been captivated. His name was Nwoye, Okonkwo's first son. It was not the mad logic of the Trinity that captivated him…It was the poetry of the new religion, something felt in the marrow. The hymn about brothers who sat in darkness and in fear seemed to answer a vague and persistent question that haunted his young soul – the question of the twins crying in the bush and the question of Ikemefuna who was killed. One of the greatest crimes a man could commit was to unmask an egwugwu in public, or to say or do anything which might reduce its immortal prestige in the eyes of the uninitiated. And this was what Enoch did. Cao, Diana. "Things Fall Apart Themes: Religion." LitCharts. LitCharts LLC, 3 Nov 2013. Web. 22 Apr 2019. Cao, Diana. "Things Fall Apart Themes: Religion." LitCharts LLC, November 3, 2013. 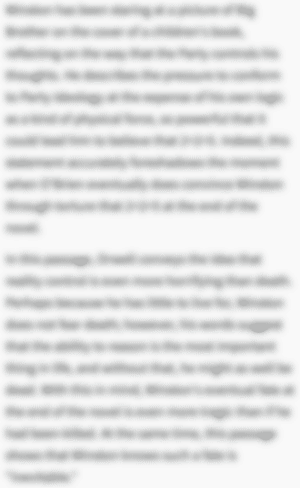 Retrieved April 22, 2019. https://www.litcharts.com/lit/things-fall-apart/themes/religion.